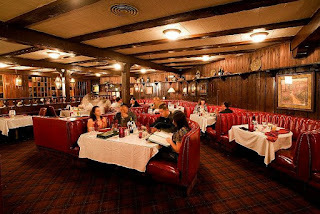 The Smoke House – a vintage restaurant still going strong! 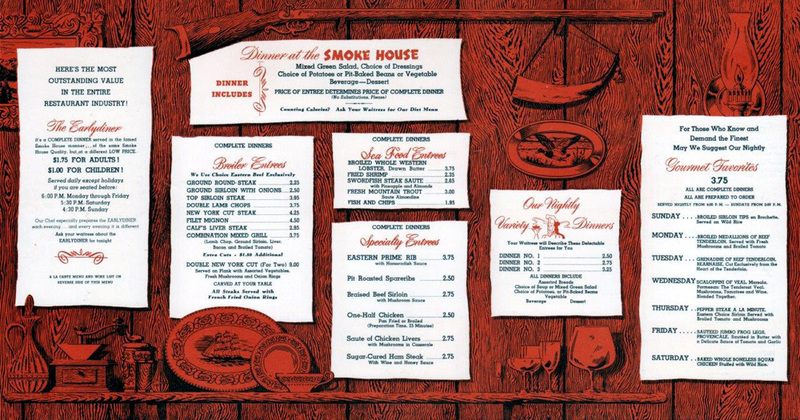 If you ever drive from Burbank around Warner Brothers and head to Hollywood on Barham Boulevard, you know where the Smoke House is located. It is hard to miss. And many people still “don’t miss it” when planning a nice meal out, some weekend entertainment, a quick lunch or any other occasion. As part of a continuing series of stories that acknowledge key parts of Burbank and its history, we took the time to meet the General Manager of The Smoke House, Manny Munoz. We wanted to get an inside look at the restaurant and its history, so we went to the best source. Manny is 31 years old, and has been with the Smoke House since he was 15. He has done everything in the restaurant and knows it inside out. When the General Manager position became available a year or so ago, the owners saw that he was the best person to lead the team, and he of course accepted the position. The Smoke House goes all the way back to 1946. It was originally located at Pass and Riverside, and moved to its current location three years later. They recently celebrated the 70th anniversary. Long time for a restaurant to be around! The restaurant can now seat over 500 guests in a number of dining areas, including a lounge/bar area, the traditional dining area, and an outside patio. There are a number of remodeling and decoration upgrades in progress, as the restaurant insures that it remains a very attractive dining destination. During warmer times of the year, the outdoor patio is also a popular hangout for the younger crowd for happy hour/after work enjoyment. Over the decades, many movie and other entertainment celebrities have frequented this landmark. The walls have pictures of many of the famous stars of the 30’s, 40’s, 50’s and more current actors and actresses. George Clooney loves the restaurant so much that he named his production company, Smoke House Productions, after the restaurant. Given the celebrity presence, the staff have worked out how to acknowledge the needs for some element of privacy and allowing the well known guests to enjoy their dining experience without being disturbed. That said, in our conversation with Manny, it became obvious that the Smoke House regards all of its patrons as being important and treats them all with care and respect. There are many guests who like to request their “favorite” tables. Manny has to sometime juggle things to accommodate everyone’s requests, but he usually makes it work. The Smoke House has been used for film shoots on many occasions, including the recently released and highly acclaimed musical, La La Land. Its rich décor and traditional restaurant design makes it a great location for location shots. Like any eating establishment, once in a while people can “overindulge” on drink. We were very impressed with the caring attitude Manny insures that the staff have toward all their guests. He reflected on times when the valets have very tactfully not given the car keys back to a patron who obviously should not be driving. Rather, they will have the patron come back in to the restaurant until he/she is more able to drive, or help the person get a cab or an uber car and work out coming back for the car the next day. So, not only does the Smoke House look after its celebrity guests, they have a very high standard for caring for all of their visitors. As far as “celebrity sightings” are concerned, given that many of the guests come over from Warner Brothers, located just across the street, sightings are more common during the lunch hours, when the actors and actresses are getting a bite when they are working on the lot. What parts of their menu are the most well known? Without hesitation, Manny said the garlic cheese bread, the prime rib and home made “secret recipe” barbecue sauce are standouts. We asked Manny how the future looks for a restaurant with this much history and tradition. Will the younger generations still keep coming? He is quite confident of that. The tradition of the Smoke House continues to be “handed down” from one generation of locals to another, with parents and grandparents bringing their children and grandchildren to share a meal. The younger crowd appreciates the experience as much as the older. They have over 6000 followers on Facebook, and Manny utilizes other social media platforms to keep in touch as well. It is great to have a local business with this much tradition and culture still going strong after 70 years. Congratulations to the Smoke House! Decorated Director Mark Kirkland: 2017 Interview!